Funrise’s new toy line, HERODRIVE combines awesome toy vehicles with the familiar faces of the DC Super Friends. The hero of the range (excuse the pun) is the motorised Batman™ Racer vehicle that comes with lights and sounds! So what better way to celebrate Funrise’s site takeover AND how much we love the Herodrive collection than with 10 things you need to know about The Batmobile™! For a hero known for his stealth and predisposition for a black and grey colour scheme, it may seem odd that the first Batmobile™ was actually a red hot rod. Introduced in the Batman’s very first appearance, Detective Comics #27, this Batmobile had no actual modifications, absent of any ‘bat’-inspired features or emblems. It wasn’t until 1968, when the comics reinvented Batman as the “Dark” Knight, that The Batmobile™ began adopting a more bat-centric design and a sleeker look. This was in the form of the black and grey coupe Batmobile™ with a giant bat’s head on the grill of the car. The changes weren’t just cosmetic. The Batmobile™ was now loaded with features for gadgetry and safety! In the pages of Batman comics over the years, The Batmobile’s™ design has varied drastically, from concept cars to sports cars, with a few tanks thrown in for good measure! Regardless of each one’s popularity, design, or efficiency, each is an integral entry in the vehicle’s storied history. 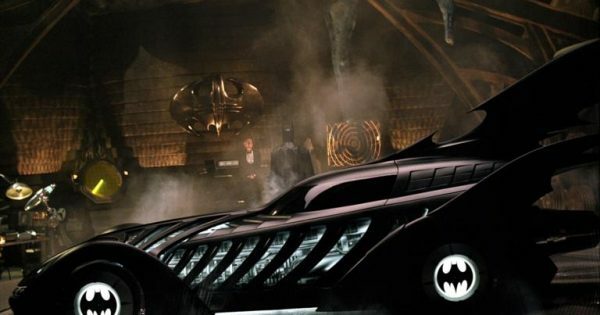 Live-action Batmobiles™ have been just as impressive as their comic book counterparts. Needing to actually perform, these cars are nothing short of marvels. The men and women who built these magnificent vehicles used many different methods to do so, oftentimes repurposing parts from other cars. The Batmobile™ obviously has some very enhanced specs that allow it to perform the way it does. Not only is the engine highly-advanced, but there are added booster capabilities and an enhanced suspension. The Batmobile™ has been said to be able to reach up to 230 mph. However, with the added turbo boosters, the Batmobile™ has clocked in at speeds between 330 and 350 mph. Hands up if any of you remember Tour De Gotham City™ and that red, metal pole that you would put on your steering wheel to keep your car safe from thieving criminals. Well, Batman™ has more money to spend on security system. Most of The Batmobiles™ have come equipped with automated defences as intimidating to bad guys as the Caped Crusader himself! Not only is The Batmobile™ stuffed with extra supplies and useful gadgets, but Batman™ somehow manages to fit an entire laboratory and supercomputer inside! As new artists and writers make their mark on the Batman™ comics, each has had his or her own take on The Batmobile™. From new gadgets and weaponry, to body design and colour, The Batmobile continues to capture the imagination of any Batman™ fan! Do you love the live-action Batmobiles™ and wish you could see one up close? Well, Warner Bros. Entertainment did a cross-country tour with all the cinematic Batmobiles™, allowing fans an up close look at these legendary vehicles. They not only displayed these vehicles but also gave fans in-depth details on each vehicle’s specs and history. The only vehicles as awesome as The Batmobile™ are the DC Super Friends-inspired HERORDIVE vehicles!